Few people know that Rome has a coastal line. A long road built during fascism crosses the fields that until the 19th century were unhospitable marshes, and reaches Ostia: a city of 200.000, formally a part of Rome, but physically divided from it. 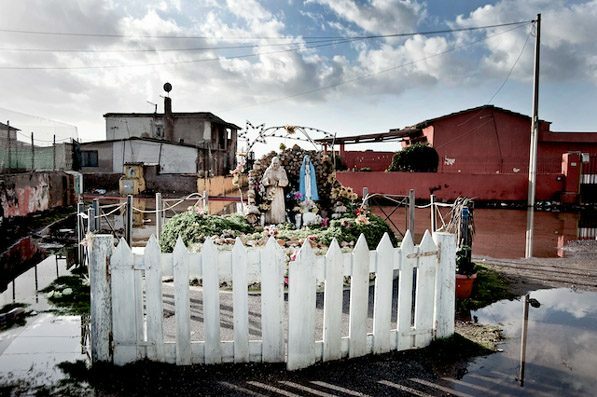 The function Ostia has as a site to display power (the coast of Rome that Mussolini dreamed, or the beaches for the rich, or the “big projects” that periodically fail in their announced intentions to upgrade Ostia) overlaps with another function: Ostia as a dumping site for the remains of the growth of Rome, for those evicted from the city, that inhabit the enormous peripheries of this periphery. In the 70s the City Council sent to Ostia more than 10,000 people were deported from the spontaneous neighborhoods of Eastern Rome: the announced intention to “dignify” life for the “slum dwellers” ended up creating highly conflictive neighborhoods without even the basic services of urbanization. A couple of miles from this, on the mouth of the tiver Tiber, there is the last self-built neighborhood of Rome: Ostia’s Idroscalo, where Italians, migrants, Rom, non-Rom, live in some 500 self-built houses, and have been fighting during half a century for regularization of their dwellings, against the threat of demolition, and against the repetition of past mistakes. 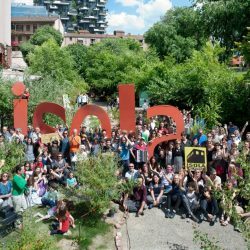 On the blog Osservatorio Idroscalo we explain an activity of study and encounter with the residents that the University of Rome organized in April, 2016, in Idroscalo. You can also listen to the audio of the final meeting, to understand the terms of the debate about the neighborhood! Near Idroscalo there is the vacant lot where in 1975 the dead body of Pierpaolo Pasolini was found. The event influenced the public representation of the neighborhood, pushing it to assume the mythical/mystical forms that Pasolini found in the peripheries of Rome. Stefano PORTELLI, “40 anni dopo la morte di Pasolini, tra gli ‘ultimi’ dell’Idroscalo“, Napoli Monitor, 2/11/2015, also in Spanish on the Blog OACU and in Catalano on La Directa. Two articles of the same author, in Italian, explain the ongoing attempt to link these territories to organized crime and extreme right, as a form of hiding the mafia leaks inside the city government and in other parts of town, and to legitimate arbitrary dispositions. “The despise towards the peripheries, from Nuova Ostia to the Front National“, Napoli Monitor, 10/12/2015; “Neither Idroscalo is up for sale“, Dinamopress, 21/4/2016. The “Barcelona model” is arriving to Ostia too! The candidate for mayor of the Partido Democrático takes inspiration from Barceloneta to requalify the coast of Rome. What Giachetti does not know is that the ancient name of the Barceloneta was precisely, and nobody know exactly why, “neighborhood of l’Òstia”. 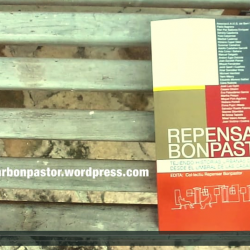 Repensar Bonpastor: finally, the book!